A local officer who retired from Northumbria Police and returned two days later to become a Special Constable has been recognised for his work in Ponteland. Jon Gray who retired after 30 years' service came back as a Special Constable and still continues to work 20-30 hours per week, doing voluntary duties. He made the finals of the Force's 2013 Excellence Awards following his dedication to the voluntary role. 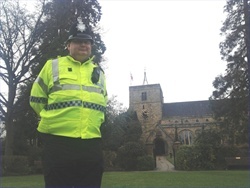 Local to the area, Jon is recognised by the residents of Ponteland and is often approached even when not on duty. Inspector Dave Balmer said: "Jon has been an asset to this team as a police officer for many years and continues to be an asset as a Special Constable. "He was nominated for the Excellence Awards and was proud to say he made the finals. The people of Ponteland really do speak highly of Jon and he works hard to uphold his loyalty, commitment and reputation within Ponteland. "Jon regularly pops into the station to update victims to update intelligence and has one of the highest amounts of intelligence updates in the sector. "Working in excess of 20 hours a week coupled with the experience and skills he has amassed from his 30 years as a regular officer having Jon around is a huge asset to the sector. "In the past year Jon has made a number of significant arrests and continues to exceed expectations. A simply outstanding individual, who has shown dedication to the service and his community the like of which I have not seen before." Special Constable Jon Gray said: "I thoroughly enjoy what I do and it is a love of the job that keeps me going. I was a police officer for 30 years as I always wanted to protect the community and help tackle crime - I still do. "It's not about the hours I work, it's more about the satisfaction of helping my colleagues keep Ponteland safe. "Being nominated for an Excellence Award was a real honour and I hope I can continue to help police the local community in the future." For more information about policing in your community follow Twitter @NPnmbland or like us at Facebook.com/NPNorthumberland. Google search - Police Northumberland.